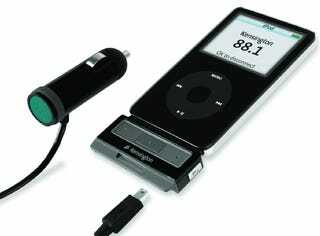 Kensington just announced their newest iPod accessory: the Quickseek FM Transmitter. It's like a Belkin with autoscan. Instead of searching through stations until a clear channel is found, the Quickseek automatically scans for open airwaves, freeing your attention for more important things (like talking on your cell, running over deer, and if you're lucky, crashing into a truckload of manure and then shouting, "McFly!"). The Quickseek also sports a detachable car charger that can power mini USB devices when not operating your iPod (USB lavalamp on the dash?) and promises to fit around most protective iPod cases. All in all, it's a promising alternative to the similar Monster iCarPlay, even at $89. But we'll give you the final verdict as soon as we put our review unit through the standard hazing tests procedure.